Gliding- Parlor Trick, or Vanishing Act? Being incapable of natural flight, humans have always had their imaginations teased by the animals that take to the skies. Of all the flight methods, gliding is one that upon first-sight seems to defy logic; after all, how can something that has obvious weight just stay in flight without thrust and no immediate source of lift? The evolutionary logic behind its development in forest-dwellers is a bit hard to pin, however. Contrary to first thought, gliding isn’t actually as practical as it may seem: it isn’t useable for sustained flight, requiring a more taxing amount of energy than lateral movement partly due to needing an initial launch height to glide any sort of meaningful distance. Also, these animals are all part of species that are primarily ground-stricken. This may lead one to the conclusion that gliding may just be a cool, albeit rarely useful evolutionary trait if it requires them so much more energy than just walking. However, evolution gave these gliders some very crafty tricks to get around their environments. In a 2011 study by Greg Byrnes, Thomas Libby, Norman T.-L. Lim, and Andrew J. Spence, the efficiency of gliding compared to lateral movement in colugos (Galeopterus variegatus) was examined. It is reasonable to think that gliding is energetically more efficient than walking since it is just “floating through air”, put basically. Interestingly enough, the study showed that for the colugos to climb a tree and glide cost them 1.5x more energy than moving the same distance horizontally on foot. Colugos are one of the best mammalian gliders out there too! Therefore, the colugos disproved the conjecture that gliding is not useful for saving energy in flight! There is one exception to this: is if the horizontal velocity of the glide is very slow compared to vertical distance the glider travels, gliding is more economical. This is the principle the albatross exploits as the best at conserving energy among birds. The colugo, or "flying lemur"
So if gliding doesn’t save energy, what is the reason behind the development of this trait in these animals? These animals don’t necessarily need to glide at all; their primary form of transportation is and always has been on the ground. The development of a trait such as gliding in these animals was not one evolved to save energy, therefore if it expended a lot of energy it had to have an important purpose, right? The colugo was one of a fairly huge group of forest-dwelling animals that became able to glide as a means of staying alive. The colugos requires an initial jump at a high velocity to be able to glide; so high that it has a “ballistic range” of over 5m during takeoff. 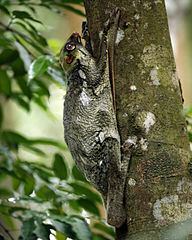 This gives the colugo ample range for a fast getaway from predators, and allowing it to move between branches in forests rapidly. The speed and rapid movement provided by gliding to these creatures allows them the ability to escape and travel away from predators other tree-dwellers would not be able to. Another common trait in gliding forested animals is that a lot of them are only found in rainforests such as those in south-east Asia, where gliding is said to have evolved from for these such creatures. Gliding in this environment would allow for rapid transit between branches, without having to travel down trees that may not have branches on their bottom 30m (dipterocarps) or when the water levels are high and they’d drown. A forest-dwelling insect, the ant, developed gliding capabilities too: it is able to leap off of a tree and perform a 180 degree turn in the air, landing back on the tree after escaping its predator. Gliding in the forest was a development not of convenience but of survival. Be it squirrels, frogs, or even ants, many forest-dwelling animals have gained new species that can glide as a method of travel. It may not be the most energy-friendly way to travel around for these animals, but fight-or-flight can take on a new meaning for these gliding forest-dwellers. Byrnes, Greg, Thomas Libby, Norman T.-L. Lim, and Andrew J. Spence. “The Journal of Experimental Biology.” Journal of Experimental Biology. 214 (2011): 2690-2696. Print. Hecht, Jeff. “Tall trees may have sparked evolution of gliding.” New Scientist. NewScientist, 20 2012. Web. 22 November 2012. <http://www.newscientist.com/article/dn22288-tall-trees-may-have-sparked-evolution-of-gliding.html>. Sanders, Robert. “Discovery of gliding ants shows wingless flight has arisen throughout the animal kingdom.” UC Berkeley News. UC Regents, 9 2005. Web. 21 Nov 2012.